Methadone (6-Dimethylamino-4,4-diphenyl-3-heptanone hydrochloride) is an opioid analgesic (synthetic opioid acting as a painkiller) that acts as a central nervous system depressant. It is used to treat opioid addiction (for example to heroin) – for detox or for substitution treatment. In rare cases, it is used as a treatment for chronic pain. The duration of the effects is significantly longer than that of heroin – usually around 24 hours. Under Bulgarian law, methadone is listed in Schedule II of the Classification of plants and substances as drugs act – High-risk substances with a purpose in human and veterinary medicine. It can be prescribed only to patients of programs for treatment with opioid agonists and agonist-antagonists by their psychiatrist. Repeated use of methadone leads to development of tolerance similarly to morphine. In some people, tolerance (the need to increase the dosage to have the same effect) develops more quickly. Methadone use leads to serious psychological dependence and physical addiction. The withdrawal symptoms are similar to those of other opioids but with a relatively delayed start and are usually lighter and have a longer duration. Methadone use may have a negative effect on activities requiring increased concentration and attention among which are driving and working with machinery especially before the patient has stabilized (in the beginning of the treatment). 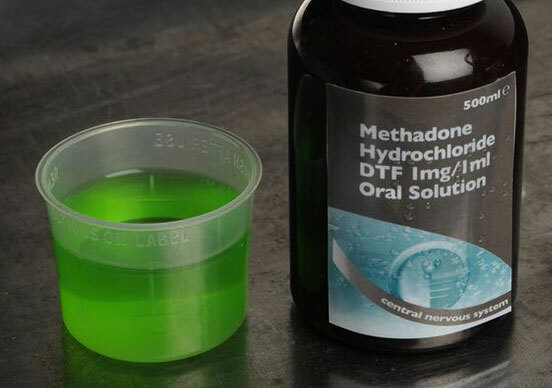 Just as with heroin and morphine, methadone use carries a risk of overdose and death. Methadone should not be used for treatment of addiction to drugs other than opioids (heroin, morphine, and other opioids).